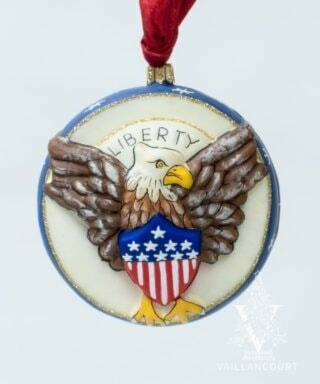 American Eagle on Washington Camp Flag Ball Ornament. New for 2018, the American Washington Eagle Jingle Ball was created with America in mind. The front depicts the classic Vaillancourt Eagle with wings spread holding the American shield while prominently displaying one of the Declaration of Independence’s unalienable rights: liberty. The back and sides of the ornament prominently display the color and six-point stars of George Washington’s camp flag used during the American Revolution. The ornament is made with mouth-blown Polish glass and is hand painted in the same tradition of all Vaillancourt’s ornaments.